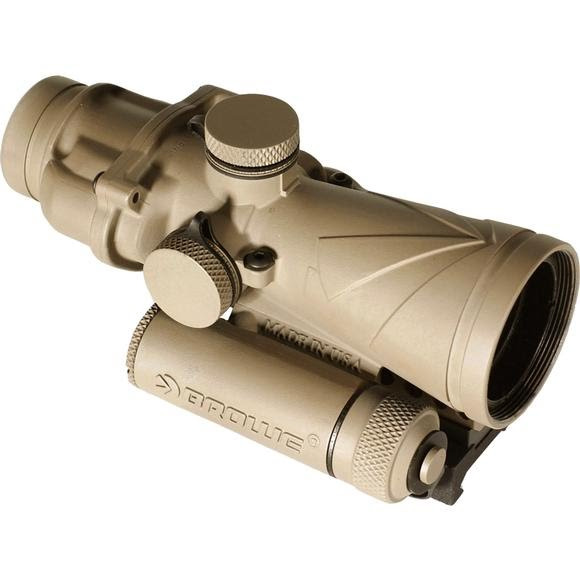 The 4x32 Browe Combat Optic (BCO) is a state-of-the-art optic that delivers highest quality optical glass, high precision machining, with a rugged military design. The BCO is a purpose designed and built optic ideally suited for tactical scenarios and well suited for military, police and sportsmen. Adjustment at 100 yards: .5 MOA. Reticle pattern: Green BCO Horseshoe and Dot with Ballistic ranging for the ACC .300 Blackout for both supersonic and subsonic and a horizontal Mil-scale graduated in 5 mil increments up to 30 Mil. Illumination source controlled-Automatic: Cadmium-Sulfide photocell and flash programmable Microcontroller. Illumination source controlled-Manual: 10 days settings and 3 night vision. Battery Usage Life: 2000 hrs. Typ. (Min. 775hrs. on max brightness). Fog proof: Filled with dry nitrogen. The BCO has a cadmium-sulfide photocell located in the optical path providing great sensitivity and accuracy of the target light that is being transmitted through the optic, not ambient lighting. It tactical environments lighting levels are very liquid and constantly changing. When nanoseconds count there is no time to make manual illumination adjustments or search for a poorly illuminated reticle. The Target Light Sensor Technology simplifies the operation and allows the operator to focus on the job at hand.